Some people can rebel outside the system; most conform within the system. Few people can be true to themselves when they are in power. But very few -- almost none -- can revolt from within and remain true to others, when in highest power. It is not that they don't want to. They can't because of the sheer weight and scale of the office they hold in government. They can't because they are not K R Narayanan, our former President who passed away this last week. You will be surprised when I write this. 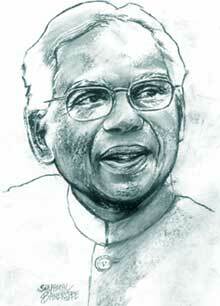 K R Narayanan will not fit your image of the strident, card-holding, revolutionary leader. Instead you will remember him for what he was -- the erudite, compassionate, graceful politician, who knew his mind. You will remember him for his integrity and for his reluctance to play the power game. You will remember him fondly and dearly for all this and more. I remember him for all this and even more. I remember him for making the system 'bend' to make space for issues, people, ideas and what was right. He did this in his own style; giving of little of himself to what he believed in. Most importantly, he did this not by standing against the system, but by standing with the system. He was the ultimate subversive: he made power good. In the mid-1990s, he was already vice-president, living in the distant and security laden areas of Delhi. My colleague Anil Agarwal, of whom he was very fond, asked if he would release a book on air pollution. Sounds innocuous, does it not. After all, this is what all leaders are expected to do -- launch books, shows, seminars and cut ribbons and lay foundation stones for bridges, buildings and blocks. But this was not one of 'those' events. The book was titled Slow Murder ; it indicted the most powerful industrialists in the country for producing vehicles that killed people slowly but surely; it demanded change with stridency of an angry rebel. This was also the time when Delhi was choking on the spit of its vehicles; but it was the time when nobody cared. K R Narayanan not only agreed to release the book, he agreed to do it from his own palatial and powerful vice- presidential house. In one stroke, the profile of the concern changed. It became acceptable. It became powerful. Later, Anil went back to K R Narayanan -- this time in the grandeur and silence of the President's house to request him to inaugurate the workshop on traditional water harvesting. Again, you will say: so what is new. What was different was that this was the time when water harvesting was the small fad of small people. K R Narayanan agreed to inaugurate the meeting to give away awards to these small people -- the unsung engineers and water managers of rural India; he agreed publicly to learn from this knowledge so that the most powerful house in the country would adopt their humble science. He agreed in the meeting that "he would do water harvesting in Rashtrapathi Bhawan (the President's Estate), provided his bureaucracy would allow him". And he did. My fondest memory is of him, inspecting the rainwater harvesting recharge wells of the President's Estate, accompanied by his bewildered but respectful government engineers. Still later, he agreed enthusiastically, to visit the still unknown villagers who had brought their river to life by rainwater harvesting. His visit to Alwar to award Bhaonta-Kolyala village brought with it the pomp of the state -- the governor, chief minister and others trekking to the river to see the water that gave it life. We should remember how he admonished the government of the need to build an inclusive and just society. How he spoke of the need to account for people displaced by dams or devastated by mining. He did this, not when he was out of power or in retirement -- as most do -- but when he was holding the reigns of India's highest office. Today, we need this voice of authority and reason more than ever, as we hurtle towards growth, which can be all we want it to be: divisive and destructive or bring prosperity for all. This is why I cried at his death: a good man who made us all good has gone. We are poorer, much poorer at this loss.